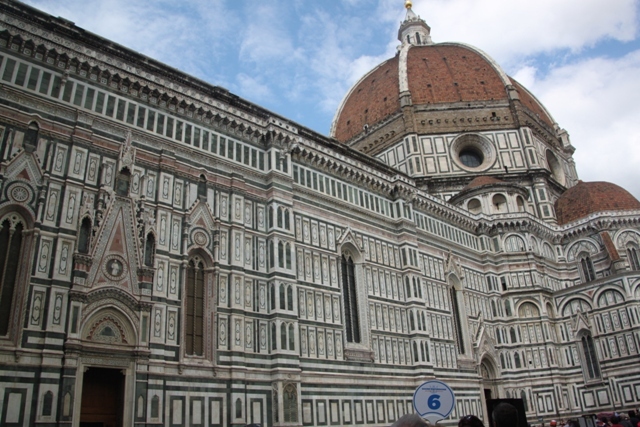 Top of our agenda on arrival day in Florence was the Duomo. 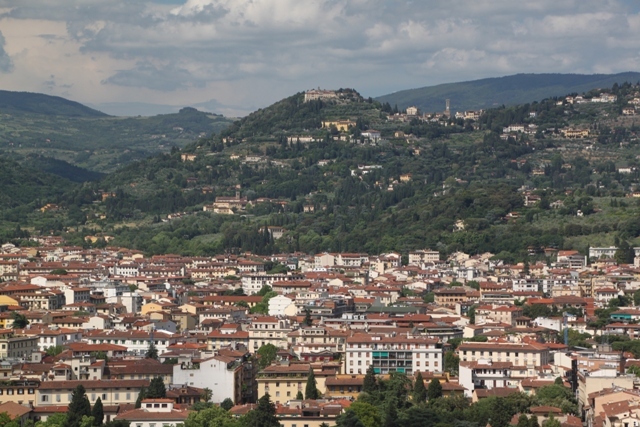 A vast Tuscan triumph, this iconic building with its brick red cupola dominates the Florence skyline, our goal for the afternoon was to climb to the top and take in the best views in the city. 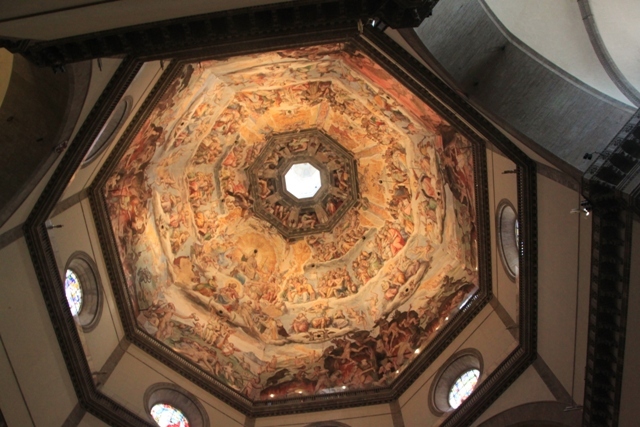 The dome is quite something and goes right back to the 15th century. In those days nobody had ever put such a big dome on a cathedral. Sceptics thought it would fall down, but all credit to the architect. Hundreds of years later this is still the largest masonry dome in the world, hundreds of people climb to the top every day. 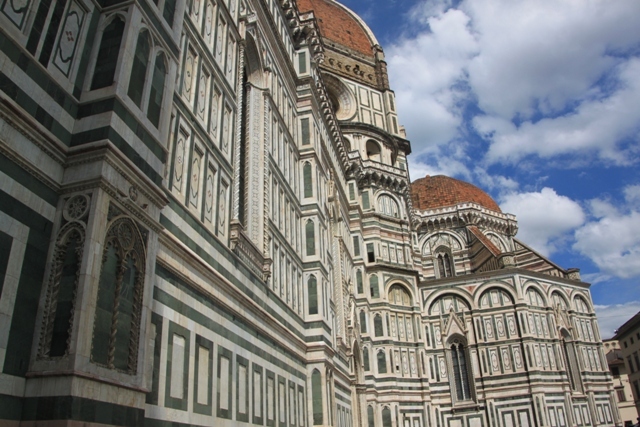 The Duomo is a massive Gothic cathedral – it can hold 20,000 people and is apparently the fourth largest cathedral in the world. It was consecrated in 1436 but they started building it in 1296. All very impressive, but it’s the outside of this place that does it for me – a real treat for the eyes with green, white and pink marble, not a bit of anything unadorned, it reminded us of a giant gingerbread house. I’ve never seen a church quite like this. We were wowed by the outside, inside we were surprised but in a different way. So ornate and fancy is the exterior that the simple and largely unadorned interior really does take your breath away. It is lovely, just a few works of art and otherwise very plain. There are 44 stained glass windows which are beautiful but inside the wow factor belongs to the dome. We got our kicks just standing right underneath and looking up. Son felt it would be a good idea to lie down on the ground and look up, we managed to dissuade him. Words fail me here, it is just breath-taking and the sense of space is something else. We had another of those conversations wondering how workmen in the 15th century with no modern kit ever managed to build such a thing. Son was not keen to linger indoors so we headed outside and joined the long queue in the square for “that” climb to the top of the tower. Fortunately after about 20 minutes of patient lining up Husband somehow figured out that the actual ticket office was on the other side of the square. A mad sprint over there, he arrived in the nick of time before we made it to the front. 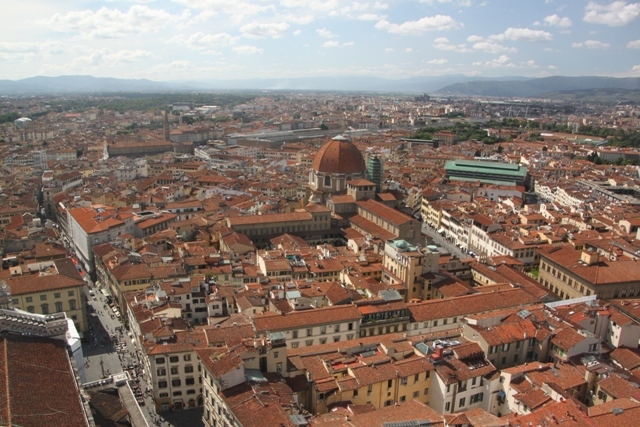 The tickets cost 10 Euro and cover the climb to the top plus entrance to the Baptistery (entrance to the cathedral itself is free). 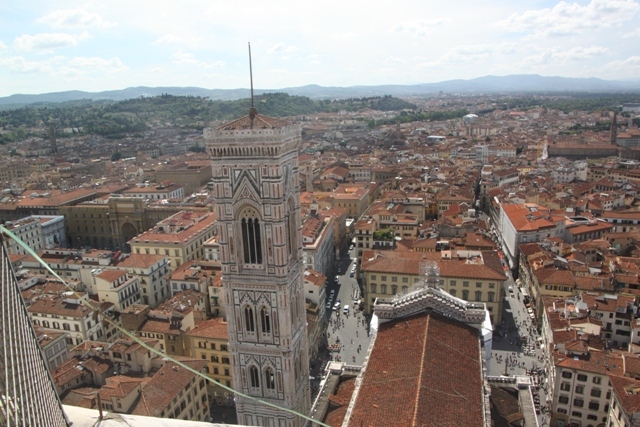 There is even another climb to the top of the bell tower included in the admission just in case 400 odd steps to the top of the Duomo is not challenging enough. We started the climb. 150 steps and we reached a viewing gallery where you can look out over the inside of the church. Then 120 more steps and we came to a guard controlling the going up and coming down. 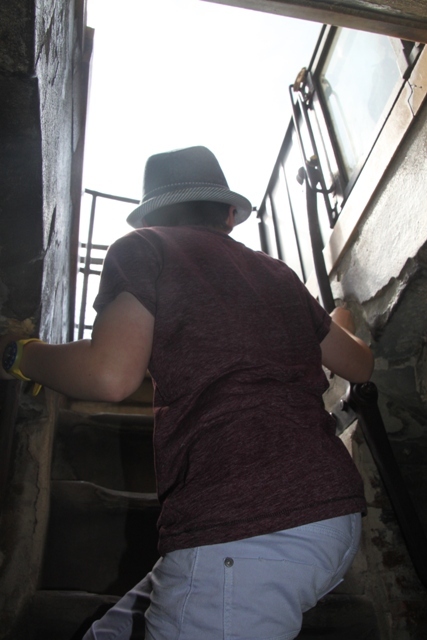 Next up was the tough part – 170 steps (yes I counted and remember every last one) via a dizzying spiral staircase then two sets of steep stone steps (barely more than ladders), through a smallish hole at the top and we’d made it. This is not for the faint hearted or those with a fear of heights and once you start, you really have to keep going however you feel about that. Blinking and squinting into the sunlight with legs of jelly, huffing and puffing and sweating it suddenly became apparent why we had put ourselves through the torture. The views are amazing. The city spreads out before you, the hills in the background and you get a real sense of just how massive this cathedral really is. A panorama like never before, it is glorious. It was pretty crowded, needless to say they don’t chase you down once you make it up there. You can stay as long as you like, which for us with Son was not as long as I would have liked! We did find a spot to sit down and take in the views for 10 minutes or so, before he was keen to get going and we had braced ourselves for the descent. Going up is hard work, going down is no picnic either. 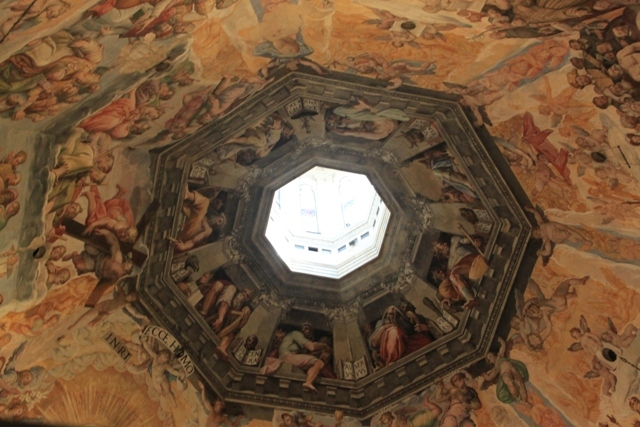 All those spirals and a bad case of aching knees this time, but a highlight for me was the great view of the fresco on the ceiling close up in the viewing area. It is stunning – Dante with the Divine Comedy, Adam and Eve atop a wedding cake and much more. Having looked at the ceiling from below where the figures were tiny, now up on the ceiling level they are massive and you get a sudden realisation of how high up you are. We made it to the bottom in one piece. Husband and I with trembling legs and a sense of achievement, Son barely ruffled and still fun of beans ready for the next thing. 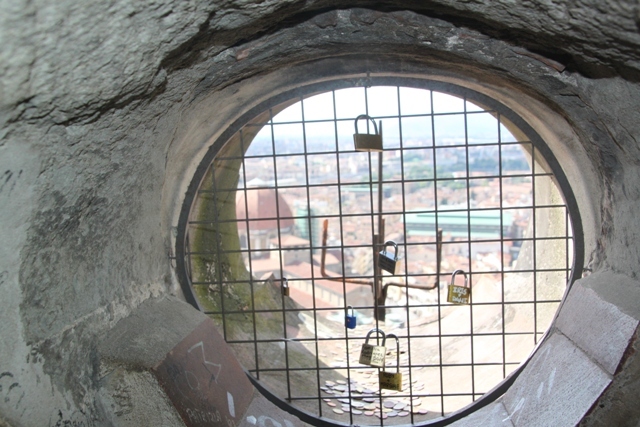 I am glad we climbed to the top, it is a Florence must-do, this is definitely a dome with a view. wow – this is incredible and amazing experience, your photos and content great! Thank you – it was hard going, but the views were worth it completely! Wow Erika, that’s great! Definitely something to look forward to, am sure you will have a fantastic time! What a shame Suzanne but sometimes there are so many places to choose, you can’t do them all! Still there is always another time! Those views are spectacular. Seeing your photos would certainly tempt me to try and climb up but I have an atrocious fear of heights so I think I would suffer a panic attack between the height and the tight space. I have a bit of a love/hate relationship with heights – sometimes I’m fine, sometimes not and I just never know, I was a bit nervous here beforehand but had no problems. Maybe all that climbing made me focus on my aching legs and took my mind off everything else!! The spaces are tight but not hot, plenty of cool breezes which makes it ok for me, but I get what you’re saying. Sometimes the panicky thoughts of what it might be like are worse than the reality for me!! We didn’t make the climb and after reading your post, I wish I had but I’m not sure I’d have made it! The views are amazing. 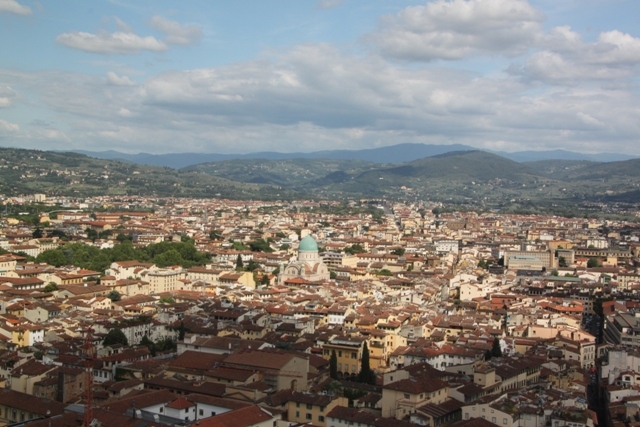 We made do with the walk up to Piazzale Michelangelo and the views were beautiful from there, too. Florence is a treasure. It was a tough climb! In the days before this trip we’d been hiking in the Cinque Terre, climbed to the top of the Leaning Tower and felt we were ready for this one, however it was very hard work. 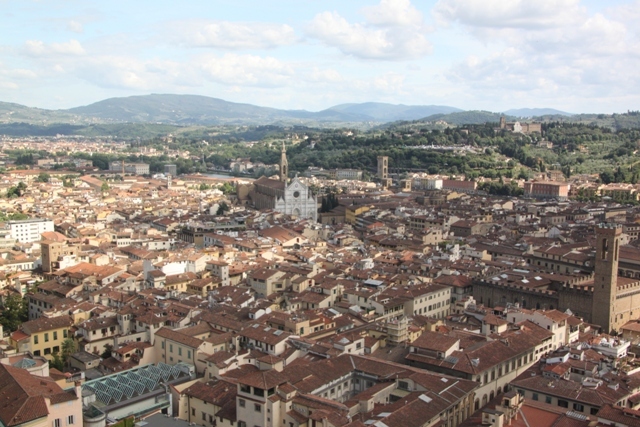 The views from Piazzale Michelangelo are stunning too – I love the view of the cathedral you get from up there. I may have to think about making this climb and rely on your photos for the view. Oh no – hope I didn’t put you off!! It is hard but definitely worth it, we saw all sorts of people of all ages making the climb, you can take your time and go at your own pace!! Wow is all I can think of! The views are just fantastic – hard work but the legs of jelly were worth it!! Thanks Diana! 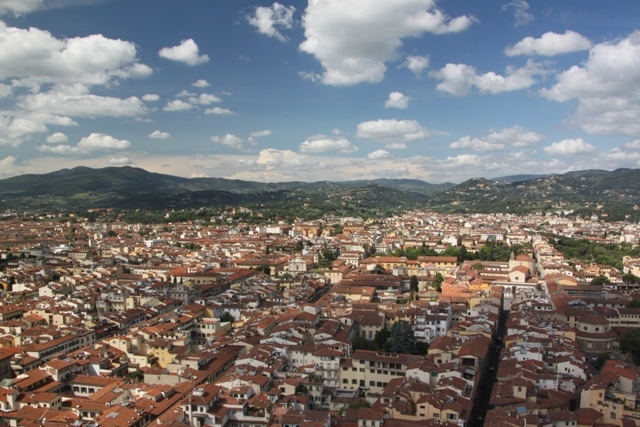 Those views are fabulous – definitely worth the sweat and toil to get to the top. The views are amazing, but to be able to get right up close to the ceiling made all those steps worth it Rosemary! Hope you have a great weekend too. Thanks Steven – looking forward to reading about your time there, it will bring me right back!! What a view ! Were you scared to climb up there ? 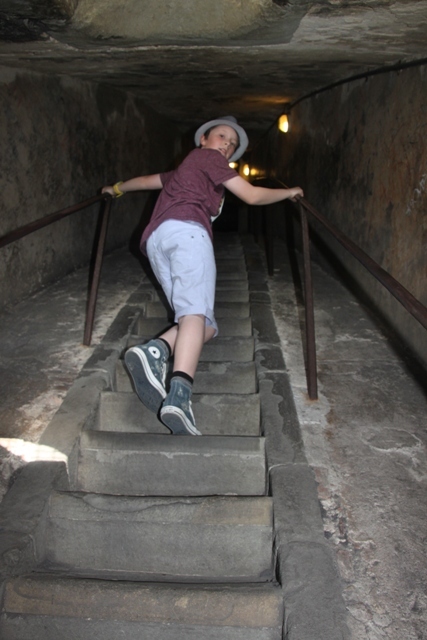 The climb was hard going, so I didn’t think about fear, just focussed on keeping my legs going up all those steps!! Right at the top it felt very safe too. Brings back happy memories of doing this 20 years ago. Not sure how my knees would stand up to it now though! Great post. We did it about 15 years ago Anabel and I definitely noticed the difference!! Still, it was worth it, you never tire of those views. To hold 20,000 people is a massive cathedral, that is like a stadium! Great pictures. It looks beautiful with some fantastic artwork inside. Never thought about it in stadium terms but so true!! Makes it more mindblowing somehow. It is a stunning church – the ceiling is just amazing. Wow this is is so incredible. This is my dream! It is a fascinating and beautiful church – the views from the top are incredible and worth that hard climb!! So jealous – Italy sounds wonderful to me right now, anything to escape this UK weather!!! We love Florence and the Cinque Terre was just stunning – looking forward to reading all about it. I hope the weather will be alright.. it’s quite early in the year. I will pack a good jumper just in case. Hopefully it will at least be brighter than here!! Brings to my mind our several visits to a favourite city. Thank you for sharing this.